It has been scorching hot and we've had barely a smatter of rain. We do our very best with hand-watering ALL the plants and trees as the cool of evening rolls around... it is tiring, but we are rewarded with plump tomatoes, herbs, squash, zucchini, potatoes, eggplant, lettuce and yes, even the odd sweet watermelon. Summer produce is so very wonderful. It's a mystery, this garden growing business - last year basil and parsley and pumpkins did famously well, this year we've had barely of any. But the chillies and tomatoes are coming in each day, and for that we are thankful! So here's to the cool of Autumn, that she might come soon and bring a steady patter of rain... p.s. 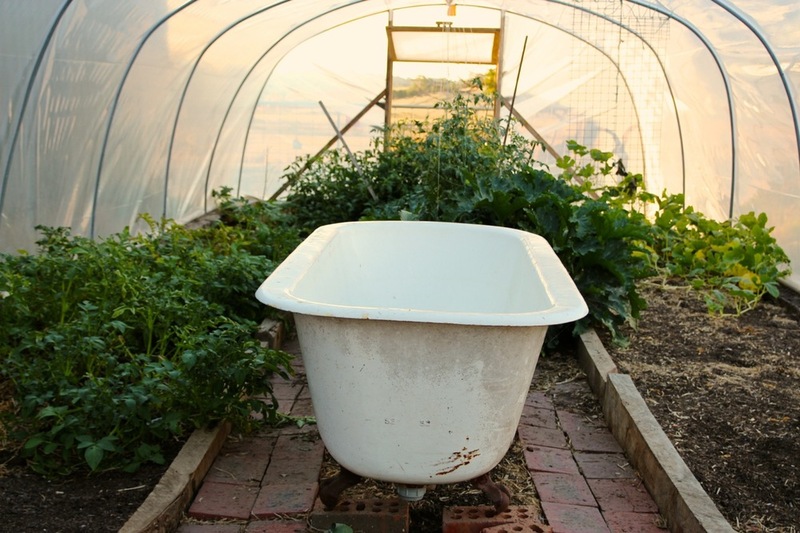 yes, the polytunnel bathtub has been upgraded to a cast-iron claw foot and also doubles as a wonderful play pen for baby while mama potters!